One Move For Big Shoulders: Seated Dumbbell Press. If you want big, strong shoulders then give the seated dumbbell press a try. Use this basic exercise with any of the following methods and workouts and watch them grow. 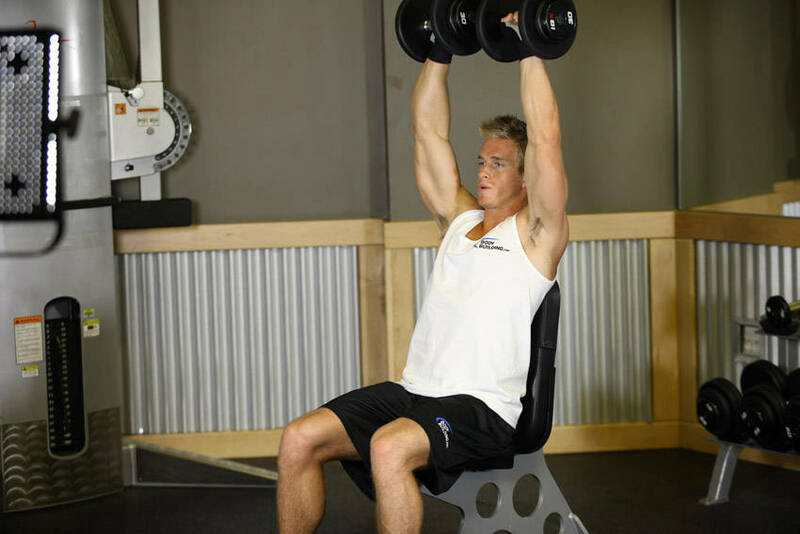 Dumbbells are great for helping improve stability and balance with each shoulder. For packing on mass and building strength in the delts, nothing beats presses. These challenging workouts will lead to improvements that will impress anyone. People talk about making gains in bodybuilding and asking what "secrets" the big guys and pros have like there is a buried treasure of muscle and strength and only the elite few have access to it. People are shocked when they find out that the basics are usually the best for making gains. Some people even say they don&apos;t believe it but it is a fact. Case in point: Basics are best for building the delts. There is one basic move that is head and shoulders above the rest. I am talking about the Seated Dumbbell Press. You take dumbbells, sit in a chair and press them over your head. OK. There is a little more to it than that. You get the idea though. This exercise and the articles that follow will be all you need to make your shoulders look like basketballs hiding under your shirt. Basics Are Best For Building The Delts. Grab a couple of dumbbells and sit on a military press bench or a utility bench that has a back support on it as you place the dumbbells upright on top of your thighs. 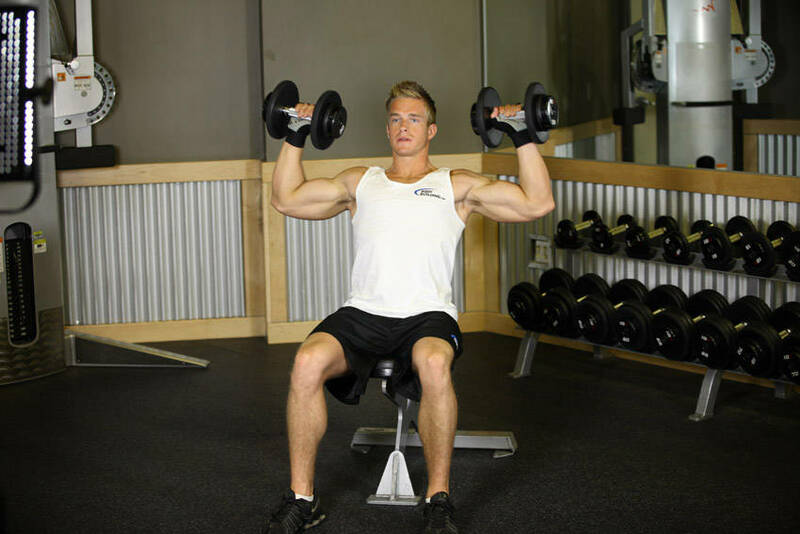 Clean the dumbbells up one at a time by using your thighs to bring the dumbbells up to shoulder height at each side. Rotate the wrists so the palms of your hands are facing forward. This is your starting position. As you exhale, push the dumbbells up until they touch at the top. After a second pause, slowly come down back to the starting position as you inhale. Repeat for the recommended amount of repetitions. To keep tension on your delts at all times, do not lock out your elbows when pressing the dumbbells. Click Here For A Video Demonstration Of Seated Dumbbell Press. For more information on this movement as well as a video demonstration check out Bodybuilding.com&apos;s Exercise Database. You know that there are no hidden secrets and you have the form down. Let&apos;s go pump some iron and get some workouts to improve those delts. The workouts that follow are intense and it would be best to have a spotter or partner help you to ensure safety. DTP is quick, intense and will not only help you pack mass. It will also serve as a good cardio workout too. 12 sets with only 45 seconds rest is all it takes to get through DTP. Oh yeah. You do a total of 310 reps. The rep scheme ranges from 50 down to 5 and then you go from 5 back to 50. This is a crazy workout and the pump will make it addicting to do over and over again. If the pump doesn&apos;t push you the results will. German Volume Training has been used in gyms and athletic centers all over the world for decades. There is more than one version of GVT but the plan for this is basic. You take one pair of dumbbells and go for 10 sets of 10 reps.
You should rest from 90 seconds to 2 minutes between sets. If you can&apos;t get all 10 sets of 10 then you use the same weight next time you train delts. If you do succeed then you use heavier weight on your next trip to the gym. This is great if you want to gain strength and you will notice size gains as well. In case you are short on time this is a great routine to get you in and out of the gym. This is unique and if you never tried this before you will be in for a shock. You grab a pair of dumbbells that are moderate in effort for you to use. Go for as many reps as you can until you reach failure. You go for as many reps as you can and once you hit failure you rest for the number of seconds it takes to get to a total of 100. Let&apos;s say you got 45 reps on your first set as an example. You rest for 55 seconds before continuing (45 + 55 = 100). Once you finish resting you do another set until you reach failure again. Say you get 25 more this time. You take that 25 and add the previous 45 for 70 total reps.
You now rest for 30 seconds (70 + 30 = 100). Now you do a third set and get 20 so now you are up to 90 total reps. That means you rest for only 10 seconds. This process continues until you get to 100 total reps.
Set 1: 45 reps with 55 seconds rest. If you want to focus on your power then this may help you. It isn&apos;t much but if you go heavy enough it will be enough for you. 5 sets of 5 reps with heavy weight. You should rest about 2 minutes between sets to give the delts time to recover for the next set. If you do this program have a partner or spotter to help you train as safely as possible. There is another "twist" you can perform in this movement to both keep the exercise from getting boring and to help shock the delt muscles to new growth. You can do what is known as the Arnold Press. You can guess who it is named after. Arnold Schwarzenegger was always looking to make training fun and find new ways to train the muscles. This was his "twist" to the Seated Dumbbell Press. You start in the seated position with the dumbbells in your hands. The difference is your palms face you. As you press the dumbbells upward twist the dumbbells so when you reach the top of the movement the palms are facing away from you as they would with regular dumbbell presses. Lower the dumbbells the opposite way so your palms are facing you again at the bottom. Of course the Exercise Database has videos of this movement also. Try each of these routines with the Seated Dumbbell Press and then with the Arnold Press. By the time you finish these workouts you will have bigger and bolder shoulders that will make it appear you have some secret formula to getting huge. Video Article: NPC Champion Justin Lovato&apos;s High Volume Training - Shoulders! NPC Champion Justin Lovato takes you through his high volume training routine for shoulders. This delt-destroying workout will challenge most trainers, yielding unparalleled pumps. Try the following boulder-shoulder routine if you think you&apos;re tough enough.